Intellectual – Thinkers, students, philosophers, scientists, teachers, guides and advisors. Leader – Rule makers & enforcers, ralliers, and sportspersons. Business – Bankers, merchants, and food growers. I find it extremely interesting that Vedic sociology recognizes these groups as being somehow helpful and important in society, especially the rebels. But mainly we will focus on the main four. When a person wants to know their ideal career or life-path – the first thing to do is narrow down the general category they are best suited for. Then, within that category one can start to get details on the specific choices. To make this first step one first needs to know how the zodiac represents these categories of social roles. This is what I intend to explain here in this article. At the simplest level you will find (if you explore the classic text of Vedic astrology with a keen eye, Brihat Parashara Horam Ch.4) that the elements earth, water, fire, and air directly correlate to the four social roles. The fire signs are places generating leaders. The earth signs generate people involved in business roles. The air signs generate tactile people. While the water signs generate intellectuals. 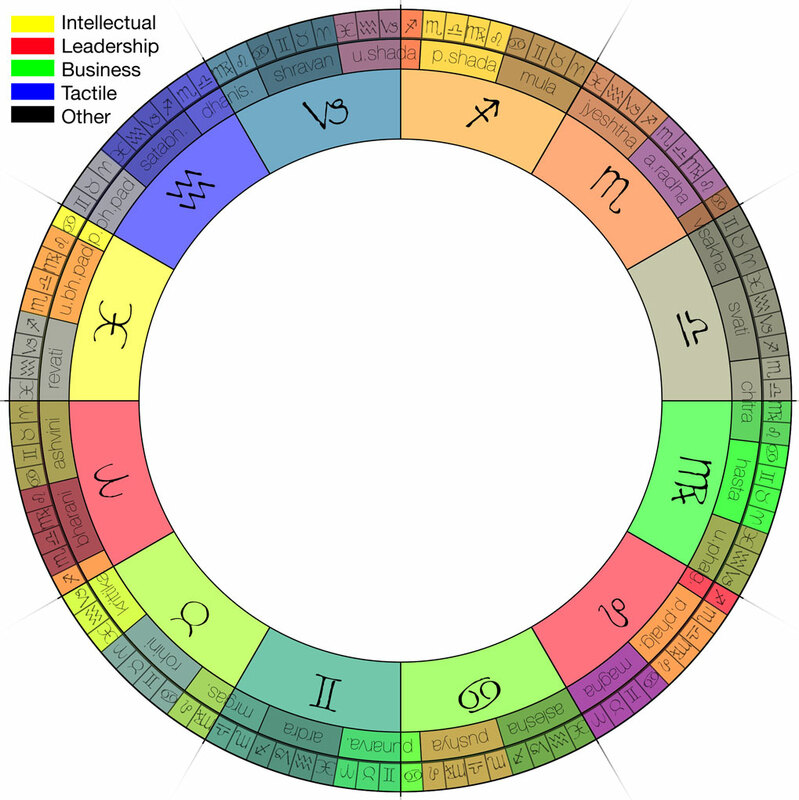 If you were to stop here, however, you would not have a very useful or realistic understanding of how the zodiac corresponds to ones career and social role. Let’s go further. 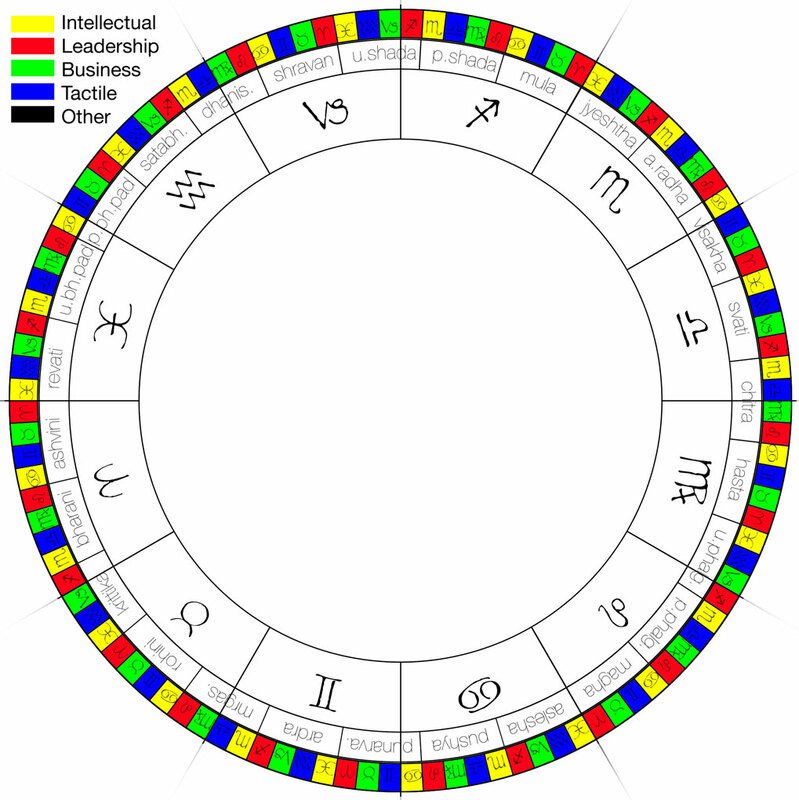 Each sign is owned by a specific planet, and each planet represents a specific one of the four social roles. Let’s map those out to the signs now. The Sun and Mars are leaders so their signs – Leo, Aries and Scorpio – gain this trait. The Moon and Mercury play business roles. Their signs – Cancer, Gemini and Virgo – acquire this trait. Jupiter and Venus are intellectual they are the teachers of the heavens. Their signs – Pisces, Sagittarius, Libra and Taurus – take on this quality as a result. Saturn is solid and tactile. His signs – Capricorn and Aquarius – become infused with this social role. 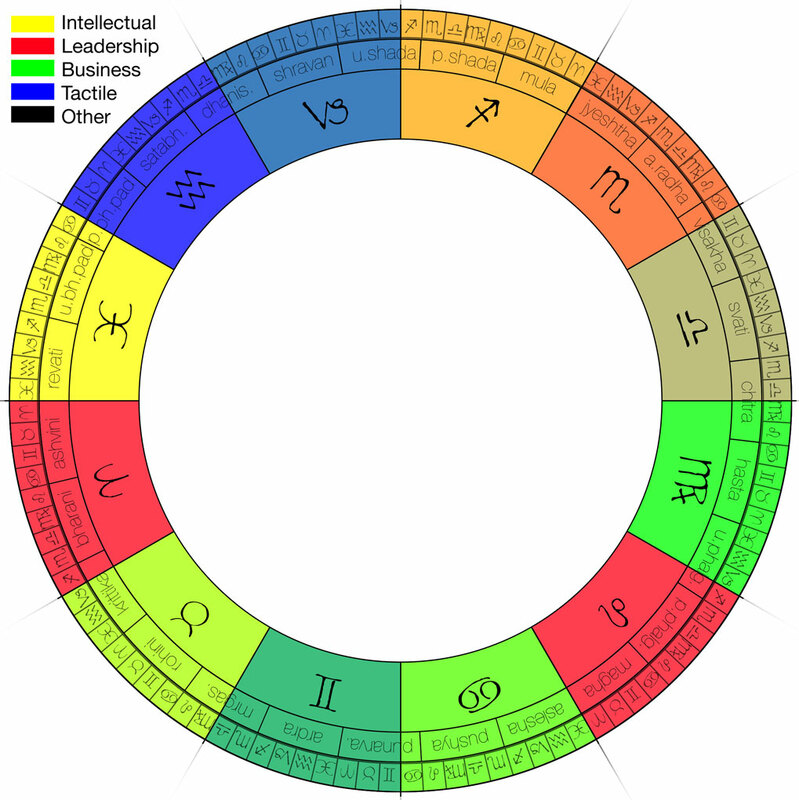 Now we have two divergent descriptions of the social roles played by the various signs of the zodiac – as you can see the two diagrams above paint different pictures. You will make a big step forward in astrology when you see simultaneous realities rather than “either / or” situations. So let’s combine the two diagrams into a single overlay. Now we are starting to see some variation and “full spectrum” which more accurately reflects the true nature of life. We see Aries and Leo remain strongly leadership oriented. But Sagittarius has changed to orange. Indeed is not the “Philosopher-King” the very often used archetype to describe the nature of Sagittarius? A combination of the yellow intellectual with the red leader creates this orange. Scorpio is a deeper orange. It has more red. It is more about leadership than philosophy, but is similar to sagittarius in that it is a blend of the two. Virgo remains pure green – pure business. Cancer has become greenish, indicating a sign where intellectualism moves towards practical results helpful for sustaining the home and family. Taurus has moved similarly – a sign where business advising and philosophy is favored. Capricorn becomes a teal. Combining blue and green – a sign where one works practically, solidly and hard for financial ends. Libra is most interesting. Blue blends with Yellow creating brown, a balanced color – anything is possible here! 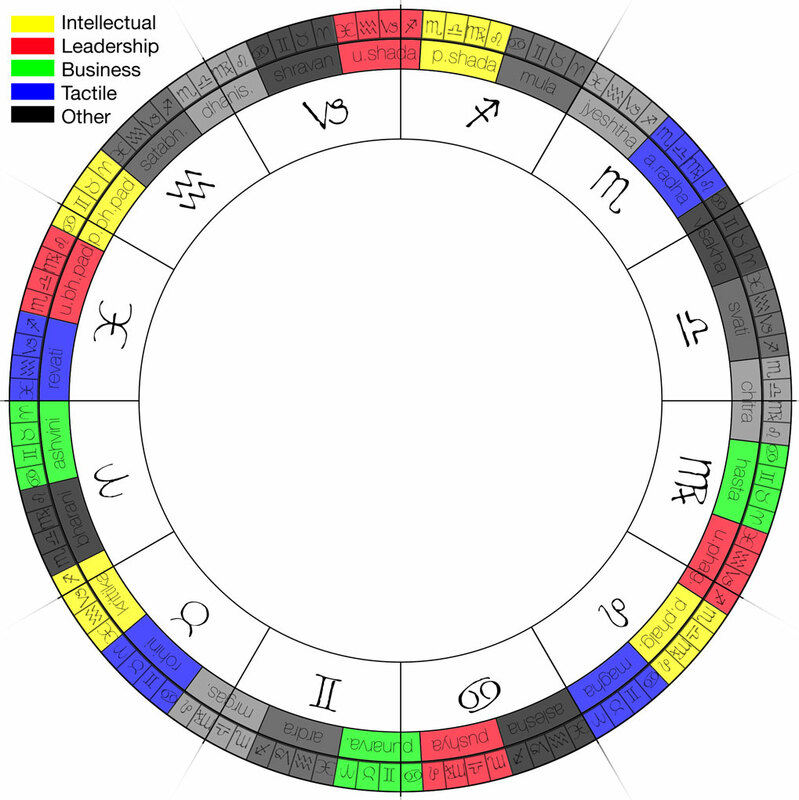 Pisces remain the only purely yellow, intellectual sign. And Aquarius remains the only purely blue, tactile sign. Now we will look at the qualities possessed by the lunar mansions. 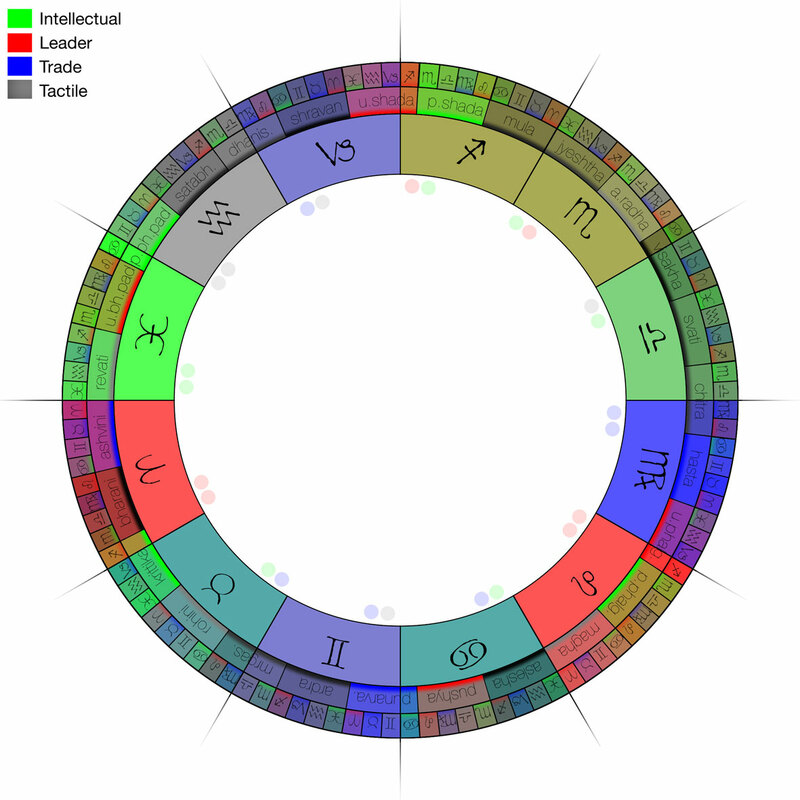 If you don’t know what lunar mansions are, you can start with this article – The Beautiful Math Behind the Zodiac Divisions. The lunar mansions are the only places in the zodiac which take into account the three sub-roles in society which I defined in the outset. I represent them here as follows – light grey is the assistant, medium grey is the dirty-worker, and dark grey is the rebel. To be fair there are two planets which also represent the rebel role in society – these are Rahu and Ketu. But since they own no signs, they do not yet come into our discussion. This data – which roles are played by which lunar mansions – that I have made a visual representation of here, comes from the authoritative book, Light on Life, by Heart de Fouw. I am not aware of the original Sanskrit source. When we overlay the lunar mansions traits with the traits of the signs we start to get very interesting and useful information. There is too much to point out in words here. A pleasant and relaxed consideration of the graphic (which you can enlarge, btw) with your eye will reveal all details. I will point you to look at how the lunar mansions change the areas of the signs they occupy. 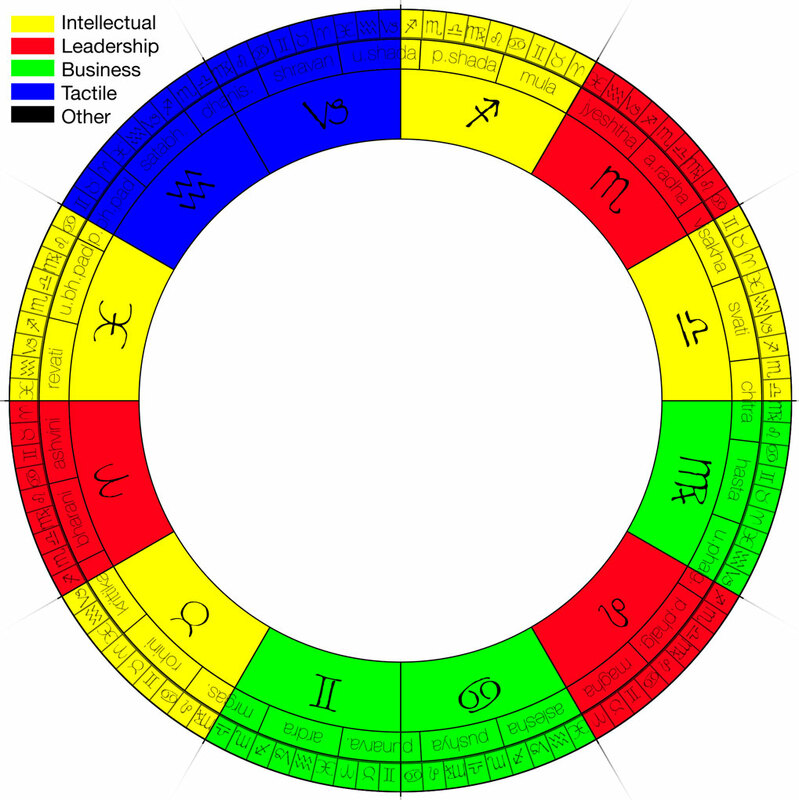 Look at leo, for example – The front part of it is a more practical, tactile sense of hands-on leadership (represented by red combining with blue, making purple) to a more philosophical, ideological leadership in the second mansion of the sign (orange, the yellow of the lunar mansion blends with the red of leo). To a small section at the very end of leo which is the purest red place in the entire zodiac (so far, at least)! Go on and examine the interplay of colors in this way and let the knowledge come easily into your mind through your eyes. Next we should consider the navamsha. Again, if you are uncertain what this is, the article I cited above is a helpful place to start. The Beautiful Math Behind the Zodiac Divisions. That article also links to two further articles to give you more details if you desire them. We will assign to the navamshas the essential root characteristics of the signs they represent. 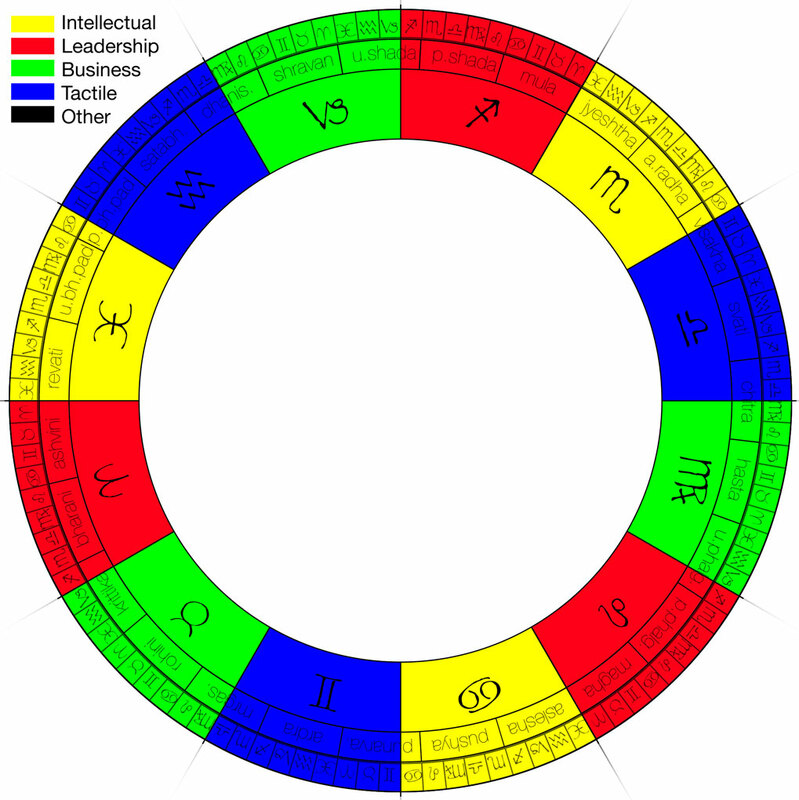 Thus every water sign in the navamsha is yellow (intellectual influence), every earth sign green (expressing it’s business influence, etc.). Next we will take these and overlay them onto the combination we have created so far! This illustration gives you a rich and rather complete visual picture of exactly what influences predominate for each 3º20′ of the zodiac! If you know about how colors combine you will be enjoying all the information you get from contemplating it! Notice the pure yellow section at the very beginning of Pisces? See how certain lunar mansions and navamshas combine to change the nature of a particular spot within a sign? For example, look at Taurus. It started out pure green (business). Got a brighter yellowish green from it’s owner being an intellectual. Then there is a lunar mansion at the front of it, called Krittika, which makes it still yellower. And within that lunar mansion, the 4th quarter – the navamsha of Pisces within Taurus is quite a bright yellow. In this specific area of Taurus there would be a whole lot more intellectualism than a few degrees down in the Gemini Navamsha, for example. 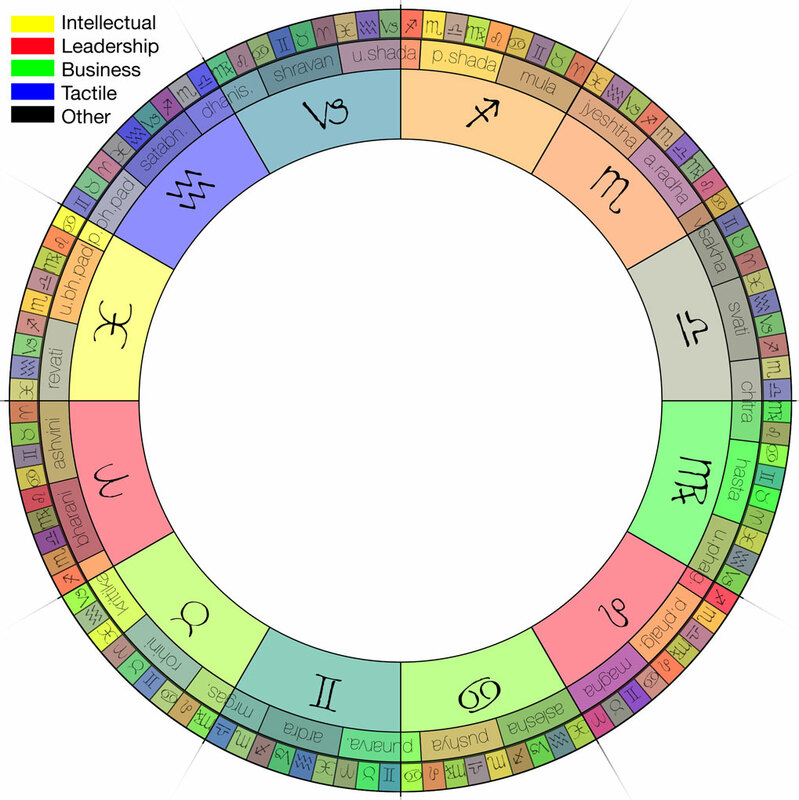 Now you take the planets in an individuals chart, knowing already what roles they represent. And see how the color of that role affects the specific spot in the zodiac they occupied when the individual was born. Especially take the 10th lord, since the 10th house pertains to career. Look at the “color” created by the 10th lord in the position of zodiac it occupies. What does this tell you about the person’s ideal career? A lot! Factor in the other planets – especially consider the color occupied by the Ascendent and the ruler of the Ascendant, as well as the Moon. Now you are ready to give some helpful and clear advice! I wasn’t happy with the color fidelity in the first set of graphics. This is the color scheme I am now using. The principles are identical, only the graphic elements have been made more accurate and easily identifiable. What an ingenious, original system! As an artist I especially delight in the information offered by the color combinations. Your integrated presentations of astrology continue to impress me. Very comprehensive. So does that mean the most suitable job/career scope i can or capable of is that Moola ‘s nakshatra nature (work scope)? The first pada of Moola is a gandanta. It is a very interesting and important area of the zodiac. The qualities of Aries (lord of the pada), Ketu (lord of the Nakshatra), Kaali (deity of the nakshatra), and Sagittarius define the resources you have available to you career wise.